Rep. Trey Gowdy (R., S.C.) could become chairman of the House Oversight and Government Reform Committee following the June 30th departure of the current chairman, Rep. Jason Chaffetz (R., Utah). 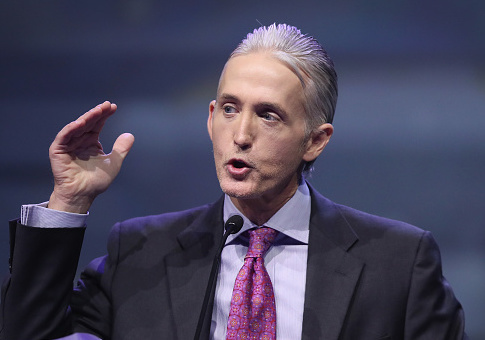 Gowdy, who led the two year House Benghazi probe, has "near unanimous" support from the 36-member House Republican Steering Committee that determines chairmanships, the Washington Post reported Tuesday. Gowdy has declined to comment on his interest, and a Gowdy spokeswoman told the Post that the congressman "is continuing to speak with members in the conference about the qualities they believe are most important for the next Chairman to possess." Several committee members said they were backing Gowdy, and that he was ready to take up the job. Rep. Tom Graves (R., Ga.), a Steering Committee member, said he plans to nominate Gowdy. "Trey’s proven himself over the last several years with the difficult roles he’s accepted, and clearly his history and his background perfectly suits him for this chairmanship," Graves said. "He’s got the trust and the confidence of our conference, and he’s going to do a fantastic job." Most of Gowdy's potential competition has stood down. Rep. Jim Jordan (R., Ohio) said that he would not pursue the position, although he outranks Gowdy in seniority. Jordan, a co-founder of the House Freedom Caucus, said he would not make a bid for the role because he has built a reputation as an anti-establishment member of the GOP caucus. "I have not been making a play, and I’m not going to," said Jordan. "Look, you guys know how this works: The establishment’s not going to put the anti-establishment guy in charge of the committee whose job it is to go after the establishment." A number of Freedom Caucus members said they were willing to back Jordan if he fought for the position. Rep. Paul Gosar (R., Ariz.) said that he would have gotten behind Jordan if he'd wanted the chairmanship. "Here’s a guy who’s been very dynamic on the committee, he’s very organized, and he identifies with people across the country," said Gosar. "Not that Trey doesn’t, but he’s been the center focus of [Oversight and Government Reform] from day one." But Jordan is backing Gowdy. "I think Trey’s probably going to be our guy, and Trey’s a good guy," Jordan said. Rep. Dennis A. Ross (R., Fla.) is also out of the running, and has chosen to support Gowdy. "He’s got the credibility. He’s got the expertise," Ross told the Post. "He knows the jurisdiction of the committee very well, having served on it for six years. And he can do the legislation that’s necessary." While it seems most of Gowdy's opponents have stepped out of the way, at least one remains: Rep. Steven Russell (R., Okla.). Russell is considered well-respected among his House colleagues, but lacks the background and support from the Steering Committee. But it is unlikely that Russell will pose much of a threat: he told the Post that he is running for chairman with Gowdy's support, more to raise his profile for a possible future vacancy. "I’m very aware of what goes on behind those closed doors, but I think it’s also important to provide a depth of bench," Russell said. "Do we honestly think that we will not be facing this problem again in a couple of years? Mr. Gowdy is in high demand. If there were a federal prosecuting job or something of that nature that were to come along, then rightfully so it would be of great interest to him." The likely handoff from Chaffetz to Gowdy comes amid questions as to whether or not the Committee and Republican Congress will investigate alleged ties between associates of President Donald Trump and the Russian government. Chaffetz only recently began investigating possible attempts by the White House to deter a federal probe into the connections. Chaffetz had also invited former FBI Director James Comey to testify before the Committee this week, before Comey's firing earlier this month. That testimony was cancelled when it became unclear as to whether or not it would interfere with the ongoing investigation led by the FBI. It is unclear whether Comey will appear before the committee with Gowdy at the helm. The Steering Committee will meet in early June, the week after Memorial day, to select the new Oversight Committee chairman. This entry was posted in Politics and tagged House Oversight and Government Reform Committee, Jason Chaffetz, Jim Jordan, Trey Gowdy, Washington Post. Bookmark the permalink.